Chabad of North Irvine Hebrew School offers a stimulating yet friendly environment where children embrace their Jewish roots and gain a true sense of Jewish pride, no matter their level of observance or affiliation. Children ages 5 -13, acquire a broad knowledge of Judaism through a motivating and challenging venue. Our students gain an appreciation for the joys, values and traditions of our heritage as it is vividly brought to life by the dedicated and enthusiastic teachers whose creativity and dynamism make every lesson a unique learning experience. 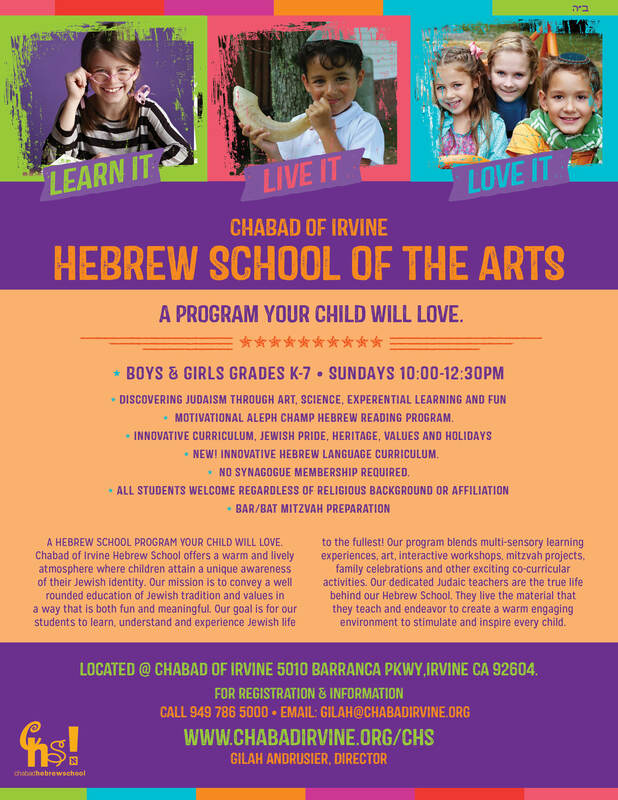 Chabad of North Irvine's Hebrew School is run in conjuction with Chabad of Irvine. The Chabad Hebrew School takes place at Chabad of Irvine and it is run by our very own Rebbetzin Gilah.